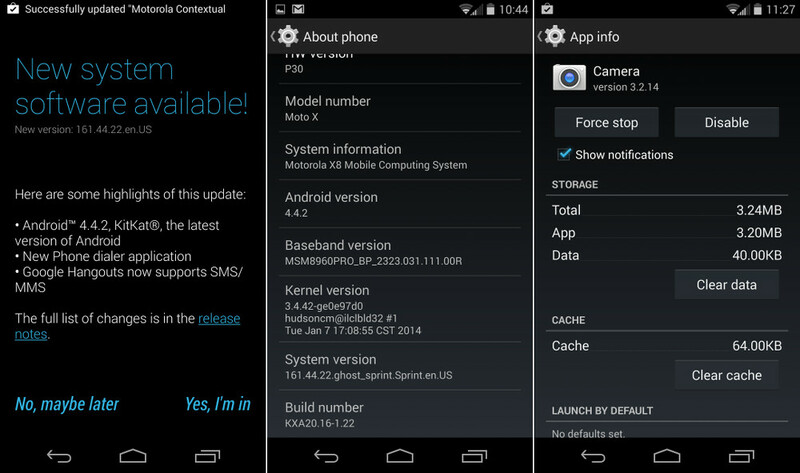 The Moto X received Android 4.4 “Kit Kat” in what can only be referred to as record time back in November. That record was short lived, however, as its little brother (Moto G) topped it by seeing Android 4.4.2 from Motorola only weeks later. That new Moto G record has had Moto X owners wondering for weeks when they would see similar love. Last week, a single, lucky user received Android 4.4.2 on his Verizon Moto X, but no other reports outside of that showed that the update was anywhere near rolling out to the masses or even in a smaller soak test-like capacity. And then this weekend, another lucky Moto X owner – this time on Sprint – received a similar update to 4.4.2. The update bumped his phone to build 161.44.22, which is certainly newer than the 4.4 update build of 143.44.8. The Verizon build from last week was 161.55.25. The update shows new versions of the Camera (3.2.14), Migrate, and Assist, all of which have been made available for download. And that’s all we know. Motorola hasn’t said when 4.4.2 will roll out, no soak tests have been started, and these updates seem to be showing up on individual devices, not in any sort of wave to multiples.